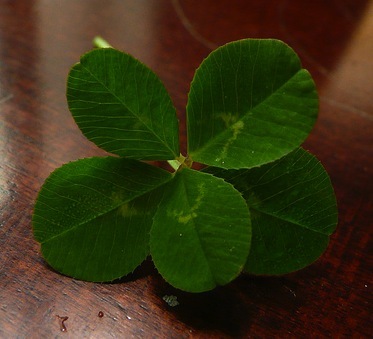 Today we're talking with Lorie Johnson, who says this five-leaf clover from her garden is "as rare a mutant as I am." My name is Lorie Johnson, and I'm 51. World wandering Philosopher-Geek and autotelic Aspergian audiophile. I have extraordinary hearing. Absolutely stunning dimensional clarity and sensitivity. I live through my ears, which is fine, since my vision is wonky. Even at my age, I can still hear things pitched for younger ears, including dog-whistles, CFL and fluorescent lights, and flyback transformers on old CRT TVs and monitors. The 'teen buzz' ringtone was like an icepick through my ears. The downside of this is that when there is an 'off' sound, or some little weirdness, I have to hunt it down and find its source. This is good when it comes to keeping my car and other mechanical things maintained, but not so good when I need to concentrate on something and some little random noise is pulling me away. My Siamese cat knows this, and heads for the nearest plastic bag that he rattles to get me to pay attention to him. I am also very technologically oriented. I joke that the first word I learned to read was "Sony." I loved playing with our old reel-to-reel tape decks and record players as a kid. I picked up on computers very quickly when I got my first on 20+ years ago. I rapidly became adept at using them and fixing them. Someone once called me a 'computer whisperer' because of my talents with figuring out the problem and fixing it. I've uncovered some really obscure problems that way. But it's not only computers -- I am capable of 'mind-melding' with pretty much anything technical and getting it to work. And language is yet another 'superpower.' I was considered a snob when I was young and used advanced language and vocabulary. As an adult, it's properly appreciated as fluency. And I am as adept at paring things down to their essences as I am at using involved descriptions. Getting a good job done with minimal difficulty or help makes me satisfied. When I leave the desk of a colleague, they have a working computer, and are probably laughing, too. Being praised and appreciated for my knack of zeroing in on a problem and fixing it makes me very valuable to my workplace. Having a tidy house and yard -- cleaning All The Things -- also makes me oddly happy, too. There's nothing like that feeling I get when I regard my freshly mown yard or washed car. I love geeky t-shirts and goofy signs. I have one that says, "Instant Human: Just add coffee." I am happiest in jeans, an interesting t-shirt, and comfy shoes. I love learning new things, and new skills. Writing great things and getting positive responses from them satisfies me. I am much clearer with the written than with the spoken word, and a couple of my essays have actually been published in textbooks. I seem to have a very clear and concise 'voice' in my writing, and keen observational abilities, as well. I think this comes from decades of trying to figure out this 'wrong planet' I've been stranded on. Listening to really good music makes me very happy. I'm an audiophile -- the good sort -- it's all about the music to me. The playback equipment is secondary, but my gear is top-class nonetheless. I'd rather spend more money on a top-flight system that sounds good than be cheap and end up being unhappy about the sound quality. I even audition wind-chimes. There is a quality to certain sounds (and colors and scents) that is very compelling and comforting to me. I really dislike when there is a miscommunication or misunderstanding. It makes me feel really stupid, sometimes. I've done a lot to educate my colleagues about my particular needs -- like preferring written over spoken directions. I have a hard time listening and understanding at the same time, and tend to get anxious about getting things right. I have a hard time taking notes from a phone conversation -- it takes me a while to coordinate the listening and the writing. This can lead to problems, too. It's made me a bit phone-phobic, sad to say. I hate 'falling out of the pattern' when I get flustered, angry, harried or frightened. It takes me a while to get my timing back when this happens. I sometimes have to find a quiet place, sit down, and take a few deep breaths to 'reset' myself. Filth, disorder, and certain kinds of clutter make me very anxious. I can deal with dust, papers and books, and minor cat-chaos (their toys on the floor, a messed-up rug, some shed fur), but filth and disorder bother me. I take very good care of my things- from my car to my clothing, and while there might be some wear and tear, most of my things look almost new. My home looks lived-in, but also well cared for. I love technology and music. And science and metaphysics, as well. I can talk your ear off about nutrition and exercise, then turn around and talk your other ear off about electronic dance music and synthesizers. I'm truly a polymath, although I wish my actual math skills were a bit stronger. Quietly. I am not into loud sensory overload places like clubs (even though I adore club music), and absolutely hate crowds. My idea of a party is a few friends, some good food, conversation, and maybe a movie. A dozen people are about all I can handle in one setting, less is better. I've noticed that as I get older, crowds bother me more than they used to. I used to love to go to science fiction conventions, but not so much anymore. The internet has been a godsend for me -- I can be social, and also solitary, if that makes sense. I call it being a 'netrovert.' Other people underfoot or in my 'space' just bother me in a basic way -- they don't mean to, but I have a limited amount of time that I can bear to be in anyone's company. If I go over my limit, I morph into a cranky polar bear. Understanding, acceptance, and intelligent humor. Appreciation of good food, wine, books and music. I wish I could speak as well as I write. Everything I do involving casual acquaintances and strangers is rehearsed and scripted to some extent. I've internalized them to the point where they sound natural, but I still hate being at a loss for words, especially when I am really engaged, aroused, or angry. And I wish I could have picked up the nuances of people at a younger age. I still don't 'get' a lot of what nypicals find important -- like the whole couples thing. I prefer my own company, to be honest. Being an adult female makes me realize how invisible I am as far as my Asperger's is concerned. I was able to blend in so well that I pretty much became transparent in many ways. It took me many years to truly accept and embrace my differences and eccentricities, and understand that they are not defects, but gifts in their own way. Still, I had bad things happen to me as a result of my particular cognitive differences that I hope younger women are being educated about. I've been doing a lot of self-evaluation, and re-framing some of my particular peculiarities through the filter of Asperger's. It's helped me to understand why I loathe most 'girly' things and love elegantly complicated things that most women ignore or dislike. I want to learn how to create and compose electronic dance music. My learning is stalled, mostly because I am facing both a huge learning curve, and that crust of caution that middle age tends to build on one's ability to gleefully jump into new things. I know I'll screw up, but I'm hesitant to even try, which really riles me. I love electronic music, and have a headful of things that I want to share, but getting it from skull to speakers is proving to be difficult. I really need a mentor. Or some cheerful nagging. I'd like to learn an instrument too -- particularly piano or synth. Listening to a piece of music with excellent interplay of rhythm, bass, and hook elements.